I have a new and complete respect for glue. Especially the woodglue & cardboard combination. 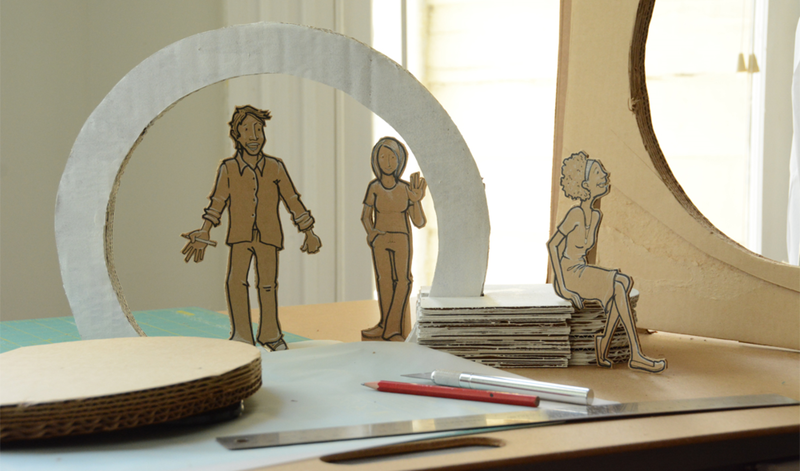 This arch, my version of a moongate, began as several layers of cardboard with a grid of glue between each piece. I put a heavy box on the stack to keep everything smooshed together while the glue set and dried. When it came time to cut out the arch I realized the glue was not kidding and I was going to go through a few blades to free the arch from the fused, solid block. A few blades later it all worked out okay but next time I think I'll do the cutting before the gluing. Now the really tricky bit. If I scale this up to actual people sizes that's a lot of glue and too much math. For now the model is fun, I learned something new and I like my cardboard people just fine.